A song may contain multiple historical inaccuracies, and still be true. Acadian Driftwood is a perfect example. 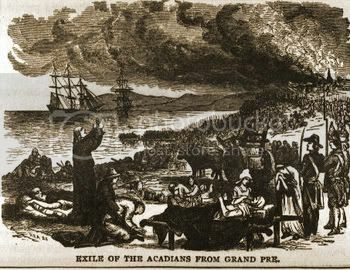 Robbie Robertson wrote the song about the deportations of Acadians from what is now eastern Canada in 1755. Robertson got many of the historical details wrong, but it doesn’t matter. The theme of the song is one that still speaks to us today. I saw something in today’s paper about refugees fleeing the upheaval in the Arab nations that are having their revolutions. Even the peaceful transitions displace people who may never have a place to call home again. This is the truth that Robertson captures so beautifully in Acadian Driftwood. Great song and nice cover. Thanks for posting. A favorite from The Band. Never knew about the true history of it, only knew it sounded like it spoke from a place of experience. Now off to read more about it.